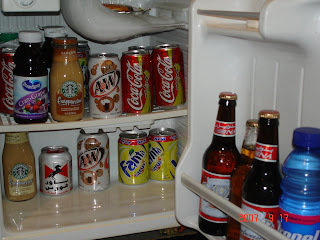 I've just filled my refrigerator with my favorite drinks, it was almost empty! they only take place there for one of my friends who adore Fanta , but for me I don't like Fanta at all! My favorite drinks are ( Coca Cola Lime , Starbucks Caramel Frappuccino, A&W Root Beer, Budweiser and Oceanspray) .